Bike 2 Campus week began Monday with a tune-up station on Sheridan Road. To promote bike safety, this year’s Bike 2 Campus week includes free helmets and bike lights handed out by University Police. University Police gave out free helmets and bike lights on campus Monday as part of an effort to promote safety and sustainability. 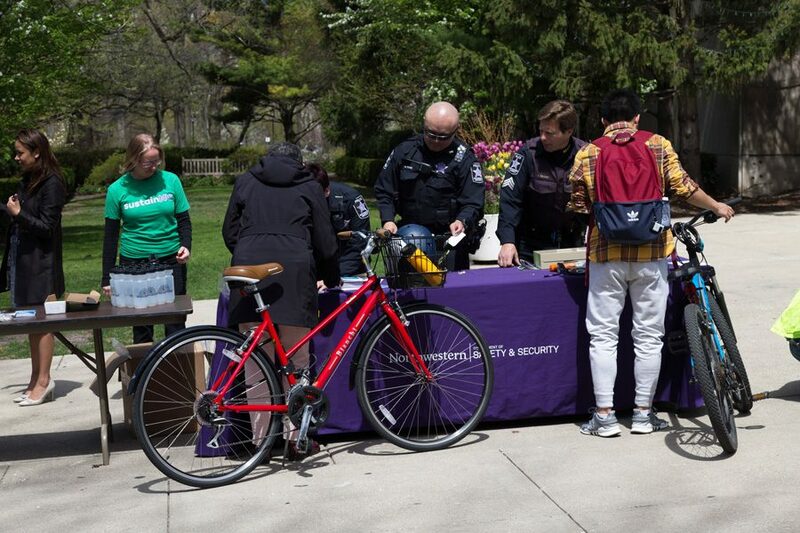 UP officers joined members of SustainNU — Northwestern’s sustainability program — in putting on Bike 2 Campus week, setting up a tune-up station on Sheridan Road outside of the Donald P. Jacobs Center, to kick off the week-long event. The tune-up station was manned by employees from Wheel and Sprocket, an Evanston bike shop. Bike 2 Campus week is a Chicago-wide event, with 10 universities and colleges, including Northwestern, who compete for the highest overall number of riders and the largest percentage of students riding, said Stephanie Folk, the sustainability communications manager for the Office of Sustainability. Students sign up and log bike trips on the event’s website. Last year, NU earned the distinction of having the highest number of cyclists on campus, Folk said. This year, however, the week is also focusing on bike safety, said deputy chief of police Gloria Graham. UP noticed many bike users on campus riding without helmets and decided to enhance the bike safety program, she said. Helmets and lights were added to the police budget, and UP officers began to distribute them for free in January, Graham said. Since the beginning of spring, she said officers have tried to be outdoors on campus once or twice a week to register bikes and give out safety supplies, in addition to attending events such as Bike 2 Campus. Folk, who is helping to organize Bike 2 Campus week, said there will be another tune-up station on Northwestern’s Chicago campus Tuesday, Folk said. While the week is focused on sustainable transportation, she said she is also concerned about biker safety. Folk, a frequent cycler, said that she moved from Chicago to the Evanston recently and found that bike lights are important for safe riding in Evanston because there is less street lighting than in the city. Bienen and Weinberg freshman Thomas Wolff was one of the students who brought his bike to the Bike 2 Campus station. Wolff, who bought his bike at the beginning of Spring Quarter to get to his classes more quickly, said that he had been riding without a helmet before registering his bike and getting the free helmet from NUPD.